What an adventure my aunt and I (Debbie) took trying to find Pike's Stockade. We began our adventure going to Antonito, Colorado where there is advertised to be a museum which we wanted to see. After much searching the small town of Antonito, I finally stopped to ask where the museum was located. I was told that the museum, which is advertised in many tourist magazines, did not exist. It was suggested to stop and see Cano’s Castle which is three blocks east of US Hwy. 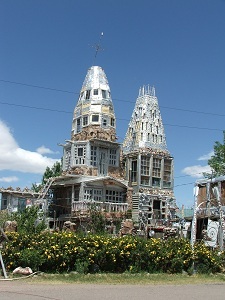 285/Main Street, between E. 10th and E. 11th Avenues on State Street in Antonito, CO.
We decided to take their recommendation and took a small detour through Antonito to see Cano’s Castle. 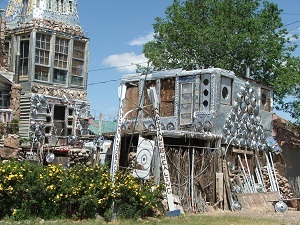 This is a home which is glittered with aluminum cans, wire, hubcaps, grills, screen doors, and window encasements. It is on Colorado’s list of most unique places as I'm sure you can see why. This is a site which is only viewed from outside. There is not an inside tour of any sort. While in Antonito, I suggest you take time to drive by and see the dazzling display of art work. My aunt and I headed from Antonito north on US Hwy. 285 to La Jara. There we took US Hwy. 136 to the small town of Sanford and got lost several times trying to find Pike’s Stockade. I hadn’t been there since elementary school and apparently didn’t take notes on how to get there. So, let me help you find it. You will come into the town of Sanford on Hwy. 136; when Hwy. 136 turns south, continue going straight east. In about a mile you will come to a dead end where you must turn right (north) or left (south). At this time, turn right where you will be on a paved highway. Travel north for approximately three miles. 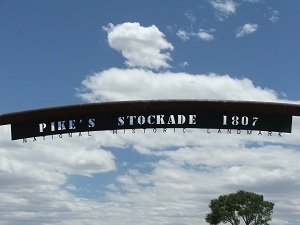 At this point you will see a sign indicating Pike’s Stockade. Turn right on this road (which is dirt) for approximately three miles and you will find the entrance to Pike's Stockade. 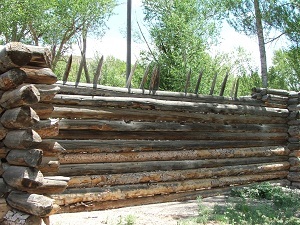 Pike's Stockade is situated in a very beautiful area near the Conejos River. 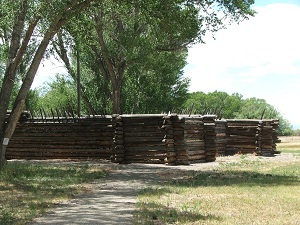 The site is a reconstructed fort based on the journals of Lt. Zebulon Montgomery Pike, written while exploring the boundaries of the Louisiana Purchase in 1806-1807. The area is well cared for with picnic areas, paved handi-cap parking, and a port-a-potty. I suggest taking bug repellant since the mosquitoes were out in force while we were there. The Stockade has a monument in a grassed area which has four plaques that explain the history of the area, including the influence of the Spanish, the Utes (calling themselves Nuche which means “The People”), the United States component in the area, and a memorial to Lt. Zebulon M. Pike. Even though it is a little out of the way I recommend taking time to go see Pike’s Stockade. It sets you back in time realizing the elements which the early explorers and inhabitants of the area had to deal with.